Here are some suggestions on how to celebrate the feast of the Holy Name of Jesus. Pope John Paul II has restored the Feast of the Holy Name of Jesus to January 3 (2014 - also First Friday, Devotion to the Sacred Heart of Jesus). 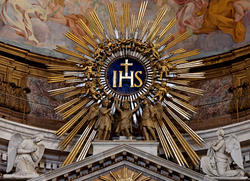 Also, the month of January is traditionally dedicated to the Holy Name of Jesus.